Leaky gut syndrome is common, and it's becoming more prevalent over time due to the standard American diet most people eat. Unfortunately, mainstream medicine doesn't always recognize leaky gut as a real problem, let alone help people heal from it. This condition isn't something to ignore. 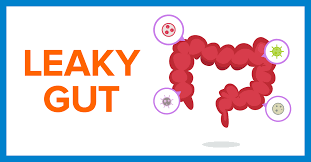 Without the appropriate treatment, leaky gut can cause a wide variety of other health problems, and it's been linked to higher incidences of autoimmune and gastrointestinal diseases. At Nichols Chiropractic in Manhattan, part of our functional approach to medicine involves looking at a patient's diet to heal issues like a damaged gut. Healthy human intestines are designed to absorb necessary nutrients while keeping everything else, including bacteria, non-nutritive food debris, and toxins, out of your bloodstream. If you have leaky gut, though, your digestive system isn't quite "watertight," and undesirable things can slip through the cracks. When too many foreign particles start to leak into your bloodstream, your immune system has to work overtime to neutralize them. This can lead to constant inflammation and digestive problems. Over time, if the gut does not heal, a leaky digestive system is associated with the development of Crohn's disease, celiac disease, and other inflammatory chronic diseases. Could you have a leaky gut? It's more likely than you might think. Not all the symptoms of this condition are obvious. Here are four of the main indicators that your gut may be leaky. 1. You're experiencing gastrointestinal problems. For example, you might feel bloated after eating, or you might suffer from constipation or diarrhea. Unexplained abdominal pain can be another symptom of this condition. 2. You feel foggy, fatigued, or depleted. When your gut is leaky, your body can't absorb nutrients as effectively. This can lead to constant fatigue and problems with concentration and memory. 3. You're getting sick more often. For instance, you might get more colds, or you might notice that your allergies or asthma have gotten worse. 4. Your mental health is suffering. Depression and anxiety often go hand-in-hand with digestive problems. Visit us at Nichols Chiropractic for a whole-person, holistic approach to healing your leaky gut syndrome and restoring your digestive health. Our expert team can help you come up with an individualized diet plan to heal your gut naturally. We can also help you manage any chronic conditions or pain associated with leaky gut. If you're ready to see a chiropractor in Manhattan KS, call us at (785) 537-2211 to take the first step towards a healthier digestive system today.